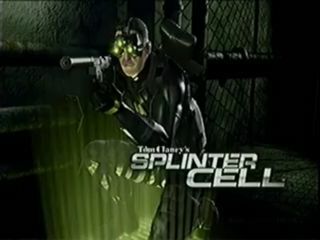 Tom Clancy's Splinter Cell is a semi-realistic stealth-action game (emphasis on 'stealth') first released for Xbox and various other systems in November 2002. A different development team made the PS2 and Gamecube versions. You play as Third Echelon operative and deadbeat dad Sam Fisher, and your journey takes you many places, including eastern Europe and China. Best Segmented, Normal Difficulty Time: 1:21:45 by Oskar 'Yautja Elder' Lundquist on 2006-08-27 done in 38 segments. Tim Bright, for making the GC NTSC run. I use some tricks and strategies from his run and combined them with some of my own. Radix and mikwuyma, for accepting my run. nate, for doing all his stuff. Gotta love tutorials. Training is actually one of the harder levels to speed run because of all the annoying training messages. The best way to avoid them is to learn when they appear and mash A, but that's sometimes hard to do because you have to do other things at the same time. After the very first training message, I use a wall jump to get up onto the wall, which is faster than doing it the intended way. Then after climbing the ladder, instead of sliding down using the zip line, I jump to the platform below, saving several seconds. In the end of this part, I use a semi hard trick that involves jumping at the right moment so that Sam is climbing the ledge over the gate while the "Lambert speech" is going. This saved more time than you'd think since Lambert actually started talking as soon as I first jumped. Even more training messages here and also a lot of check points. I was a little slow when lockpicking the door, but everything else went fine. In the first room with a camera, you're supposed to shoot the light to be able to sneak past the camera, but instead of doing this, I waited a little for the camera to look away, then I just ran past it while hugging the left wall. The second and third camera rooms were done in the same manner, by just running past the cameras. This part was perfectly executed. After crawling through the tunnel, I used a walljump to get up onto the ledge instead of climbing the pipe. Pulling Sam's legs up while sliding down a zip line makes him go faster, so obviously I did that. I got through the building without problems and at the end I didn't bother to shoot the skylights/crouch, so I took damage from the smoke, but I got through the room faster. This part was also perfectly executed. I simply ran past the first russian (the guy with the phone) without him noticing me. It's hilarious to see how I run past the second russian though, still without being noticed. The only thing that I might have been able to do a little faster was punching in the code for the balcony door, but whatever. Again I was a little slow while lockpicking, but still nothing major. I ran past the two police men talking to the drunk guy, taking some damage at the same time, a price worth paying. When going through the tunnel, I use a roll, which is much faster than crawling. After opening the gates, I run past another police man, taking some more bullets. When I shot the two guys at the end, I did it pretty well, considering that I was shooting while moving, which sometimes causes your shots to miss even if your target is in the middle of the crosshair. I started this part with so little health that I would've died from one shot. I hit the first police man once to stun him, then I run past him. I ignore the guy coming out of the door and he starts to fire at me, but an evasive roll made me survive. Note that any mistakes I do after activating the speech in the morgue doesn't matter since I still have to wait for Lambert to stop talking before I can activate the save point. In this part, I run past the police man and the civilian in the beginning and when I reach the top of the stairs, I walk slowly so that I don't alert the guys up there. After using the computer, I run past the guys outside, they never got a single shot away. The reson why I pulled out the SC-pistol after descending the stairs is that 90% of the time, the guard down there is standing in the doorway, blocking my path. I got lucky this time though. When rapelling down the wall, I time my second jump so that I fall in through the window instead of climbing in. I am very satisfied with my shooting in this segment, no missed shots. In the big hallway, I shoot the first guard with one shot so that the other guard will come running, then I shoot him when he is in the dark area, that way I don't need to hide the bodies. This was a pretty hard segment, since I used very risky strategies. I didn't waste any time when I hid the body in the large room because I'd still have to wait for the colonel to come down. I might've been able to run past the camera without shooting it, but I didn't want to risk it. A very hard segment, but I found some good strats for it. When waiting for the elevator to arrive with the two guards, I use a wall jump to get up onto the rafters. From there, I remain unnoticed from the guards and I can get into the elevator without interfering with them. After the elevator, I could've choosen two paths. One would lead me through an air vent and drop me down into a hallway later on. The other path would force me to take out three guards. The second path was obviously faster but much harder, but I chose to use it anyway. After I used Nicoladze's computer, I throw a frag grenade against the door, somehow it takes out all three guards behind it. Everything was almost perfect, this might be improvable by 1 second or something like that. This segment is totally perfected. Here you can also see what I like to call a "save-point exploit". There is some heavy lag in this level, which led to many restarts. This segment is also flawless, but also a little slow to watch in the beginning. This segment actually has some mistakes in it, but the hard parts went well. Punching in the first door code in time is actually quite hard, since you can't enter a code while there is an alarm going. Grabbing and knocking out that unarmed guy may seem like it is a fatal mistake, but fortunately I didn't lost any time from it because I still had to wait for the alarm to end later on, right before punching in the second code. The mistake that matters is that I dropped down from the split jump position a little too early, thus I had to sit through the "knock-out" animation. Good segment. The wall jump you see in the "big, white room" is actually quite hard, but it was flawlessly done in this attempt. One thing to note is that the last alarm that goes off doesn't matter; because I enter the save-point before it stops, making the game never register it. This segment is a little boring, but still interesting from a certain point of view. Knocking out Dougherty and carrying him to the save-point is a lot faster than letting him walk there by himself. Very good segment, nothing went wrong here. Ah, my favorite level, Kalinatek. Again you will see me entering a save-point in a faster, unintended way. The first knock-out in this part is probably one of the coolest things in the run, you will see why when you watch it ;). My personal favorite part of this run. Lots of enemies mean lots of shooting, and the shooting went well. I also completely skip disarming the bomb by entering the save-point before the timer runs out. The timer will be gone when the next part starts. Flawless segment. The reason why I release the first sticky shocker so late is that if would do it earlier, the door would close and I wouldn't be able to shoot the second guy. Rolling through the fire forces me to wait for the guy in the bathroom to move away from the door, but it is still faster than crawling though the air vent. Advanced AI manipulation allows me to run past the enemies in the sewers with problems. I have a lot of health to spare here and I take advantage of that by just running past a guy shooting at me. Good segment and another odd way of entering a save-point is shown. Here I found out that if I walk a couple of steps after running, the patrolling guard wont detect me, so the gate stays open and I can even run in without shooting the camera. I shoot 2 ring airfoils because my intention was to knock that guard out, but it didn't work. It doesn't matter anyway, since he got stunned and I could run past without detection. I don't like this level. The first part went fine, even though I was a little slow when punching in the door code. This level went perfectly considering that I used very risky strategies. Manipulating the enemies to reload at the right time wasn't easy, but it worked. Lots of action in this part. I used a smoke grenade to take out the first guard, incase you're wondering what happened. My strategy for those two guards who were talking was to take them both out with ring airfoils, but (as always), one airfoil didn't work properly. Still it didn't matter since I could run past him. Using a frag grenade to kill Grinko was the quickest and easiest way I could find. This is about as good as it gets. I wait for a split second before running to the ladder in the kitchen. I did this so that the enemies in the next room would run to the door, instead of shooting me through the window as I climb the ladder. Another smooth segment here with some creative use of frag grenades. Note that if I had killed the officer before he punched in the code, I would get a mission failed. A very hard segment. The wall jumps near the end are extremely hard to pull off consistently. Oh man, this part got owned. I discovered that "Goa" doesn't actually take the elevator up, he just disappears, then he respawns on the second floor. I run right after him to avoid punching in the door code and I activate the cutscene with General Feirong before Goa dies. This allows me to keep going without failing the mission (I would've failed because the game didn't register me punching in the door code and with that it assumes that I'm stuck behind the code locked doors). I like this segment. I got really lucky with the laser beams in the sewer, and the AI manipulation went smooth. Perfect segment. Evading the guards in the basement saved a lot of time. And here we are, the last segment. Everything went very good, but it took a lot of restarts to perfect the second half.